We got 1004 ratings this year! Last year had 300+, so that is simply amazing what we have done this year! 14 Years with music has past. 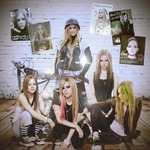 100 Songs,  23 Music Videos, 5 Albums and 1 Avril Lavigne! Here we have the "Best Avril Lavigne Songs 2016"
My Happy Ending is the victor! And down from 2nd to 3rd we have I'm With You. The album ratings are already tragic. The 1 I gave to UMS didn't help at all. So wait, last year only 300 something people voted? And this year over 1000? That's great news!! And the fans on atrl are called Avril Rangerz. You can add that too in the OP. Surprised GL is above TBDT. Massive gulf in quality between them imo. First of all thanks for this survey. Getting excited to see the results. I'm not suprised of UMS success, otherwise it isn't my favourite album. Yeah, in terms of production TBDT outshines GL. I used to love GL and hate TBDT, and now TBDT is my third favorite record and GL is my 4th. After a while it got a bit boring to me. For whatever reason her "serious" and "mature" albums are always going to outrank her "fun" ones, despite the actual quality of the music. IMO TBDT far exceeds GL. The production and overall creativity is way better. GL has a nice concept but poorly executed, outdated sounding production, and overall is nothing super special to me. It lacks in a lot of areas, particularly the songwriting and production. I'm hoping that her 6th album will be similar but done 1000x better. Make it actually sound like it's from this decade and not a 1990 reject Alanis album. I always want the DTM video to be higher - I know it's nothing amazing but I just remember being like...13/14 and seeing it on a music channel for the first time after eagerly awaiting new music from Avril hahah. Really fond of it.